Within Teamwork Projects, you can sort files by date, at individual project level and in the site-level Everything > Files section. 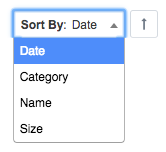 The date sort order option allows you to sort files based on the date they were uploaded to your site. From the Sort By dropdown, located in the top right corner of the Files tab, select Date. To the right of the Sort By dropdown, you will see an arrow button. You can click this to switch between ascending and descending order. When descending order (down arrow) is active, the files results will be displayed in order from newest to oldest, with the most recently uploaded files at the top of the list. When ascending order (up arrow) is active, the files results will be displayed in order from oldest to newest, with the first uploaded files shown first. You can also include sort options in saved filters. If this option is checked, the saved filter will include the sort settings currently active. Otherwise the most recent sort preference will be used.